October 3, 2011 - Varolii Corporation, the independent market and technology leader in interactive, personalized business-to-consumer text, voice and email communications, today announced that it has partnered with Southwest Airlines to streamline its process for matching pilot availability with flight needs. Using the Varolii Interact platform, Southwest Airlines uses SMS text messages to more efficiently and effectively alert pilots of flight scheduling opportunities. Based on Varolii's Software-as-a-Service (SaaS) solution, Southwest Airlines' Open Time Alerts (OTA) helps the airline quickly staff unassigned flights, ensure on-time flight operations and reduce costs from a less efficient, manual process. In cases of illness or other circumstances that prevent a pilot from attending their scheduled flights, airlines are left with "open time," or an uncovered shift, that must quickly be reassigned. Prior to implementing the OTA solution, Southwest's crew scheduling departments had to make hundreds of manual phone calls each day to pilots to fill open shifts. Schedulers were also required to follow a specific call sequence, starting with the most senior pilots, which created lag times from waiting for responses before moving on to the next pilot on the list. This not only wasted resources, but made it difficult to efficiently schedule pilots for unfilled flight times. With the Varolii Interact platform, Southwest's OTA solution provides pilots with an opt-in program that delivers SMS text messages directly to their mobile devices to alert them of open flights and give them the real-time opportunity to opt-in to staff specific flights. Each message includes detailed flight information, including the length of the assignment, overnight accommodations, if necessary, flight time and more. Pilots receive the information in a pre-determined cascade of priority, based on seniority and other factors, and can respond instantly on their phone using Varolii Interact's two-way text messaging capability to notify Southwest's crew scheduling department if they are interested in the assignment. As a result, Southwest has been able to streamline its scheduling processes and improve the flow of information to their pilot group. "With the pervasiveness of today's mobile devices, we knew we needed to adapt our communications strategy to meet the changing needs of our pilots," said Russell McCrady, senior director of crew operations and employee resources at Southwest Airlines. "Varolii Interact enables us to tap into this real-time response channel and reap the benefits of mobile capabilities. This has not only helped us to assign flights faster and easier as pilots are more apt to respond; but, the solution has nearly eliminated the need for repetitive, laborious calls to pilots. This has freed up the scheduling staff to focus on the operation and improve our overall productivity." 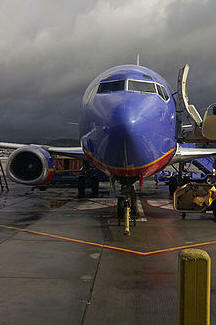 Southwest Airlines uses Varolii to exchange more than 100,000 OTA text messages to pilots each month. Out of the airline's 6,067 active pilots in the company, more than two-thirds have signed up for the opt-in OTA program since the solution was first implemented in December 2010. "Our collaborative goal with Southwest Airlines continues to be not only to improve business efficiencies, but ultimately deliver the best experience to the targeted customer," said Andrea Austin, vice president at Varolii. "At the heart of the OTA solution is the ability to ensure that flights will run as scheduled. ?By easily assigning the right pilots to open shifts, Southwest Airlines has been able to draw upon Varolii technology to significantly limit unnecessary flight delays, improving customer satisfaction and overall business performance. These kind of business-results outcomes are at the heart of our partnership with Southwest where we are both focused on delivering superior results for their business, employees and passengers alike." Varolii's technology, through its Global Network Service, automatically directs traffic to the optimal geographic region, all within a cloud environment, allowing the Southwest solution to be more resilient and self-healing. This optimized routing is based on a combination of static and adaptive metrics, including business policies, network conditions and the health of the application itself. This strategy has helped to ensure overall improved performance of the Southwest Airlines solution.